With Print and Export, you can take your Sway wherever you go. You can have an offline backup for unplanned moments without internet access, and you can physically share your Sway with others. Print your Sway to create a paper copy. Export your Sway to Word or PDF document to have the convenience of a file for editing or offline viewing. Print and Export show up as options in the ... menu. To print your Sway, go to the … menu in the top right and select Print. Sway creates a PDF that you can print for paper viewing. Print is handy for presentation notes, as well as handouts for meetings and classrooms. To export your Sway, go to the … menu in the top right and select Export. Sway gives you the option to export to a Word document or a PDF. You can open your document in Word or a PDF editor and modify or reformat the text and media. 1. 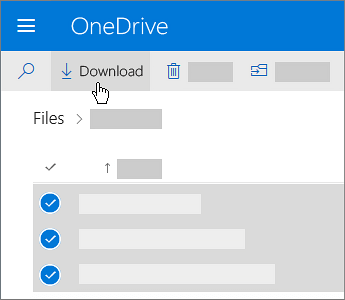 On your OneDrive Online website, select the files or folders you want to download. 3. If your browser prompts you, choose Save or Save As and browse to the location where you want to save the download. Some browsers just start saving right away to a Downloads folder on your computer. You can't download OneNote notebooks. If you download a folder that contains a OneNote notebook, the .zip file will contain an error message in the form of a .txt file. The Download button may sometimes disappear if you refresh the web page while looking at a folder. To work around this, you can go up one level in the folder directory and come back or close that tab in your browser and navigate to the folder again. In OneDrive for Business, you can't use Internet Explorer to download folders or multiple files. You can use Microsoft Edge or Google Chrome to download folders or multiple files. Downloads are subject to the following limits: individual file size limit: 15GB; total zip file size limit: 20GB; total number of files limit: 10,000. In any Web browser, go to Office 365. After notebook opened successfully in OneNote 2016, click on File and then click Export. Under export current: click Notebook and Select Format in which you want to export Notebook. Follow your browser’s prompts to save the file in the location you choose. Tip: If the notebook you’re exporting is very large or contains a large number of image or file attachments, it could take a long time to download your content. Make sure you have enough space on your hard drive to complete the Export.